It’s Friday again—and thank goodness, because I never could get the hang of Thursdays. In fact, my most recent Thursday featured—and perhaps could be described as—a seriously depressing pidney. If you’re a fan of the late, great Douglas Adams, who would have turned 60 this past Sunday, you know the dividends paid by his endlessly whimsical humor. Adams wrote several books (as well as teleplays, stage plays, and computer games), most famously, The Hitchhiker’s Guide to the Galaxy. His ability to so clearly delineate the utter ridiculousness of humanity in general—and to be self-deprecating on behalf of all of us—has always delighted me. 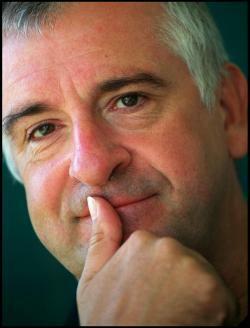 Adams co-wrote The Meaning of Liff in 1983 with comedian and TV producer John Lloyd. Billed as “a dictionary of things there aren’t any words for yet,” it uses toponymy and etymology to define common-but-unnamed things and experiences with the strange names of real places, most of them in the UK. Liff is a village in Scotland. A more famous place in Scotland, Glasgow, is defined as “the feeling of infinite sadness engendered when walking through a place filled with happy people 15 years younger than yourself.” And then there’s Massachusetts: “(pl n), those items and particles which people who have blown their noses are searching for when they look into their hankies.” Somehow that feels like old-fashioned snootiness from across the pond, but I’ll take it. True fans can still buy copies of the book or its double-wide sequel, The Deeper Meaning of Liff, but the eponymous and excellent Twitter feed keeps the lexicon Adams and Lloyd started alive—and growing, with an apparent mix of original examples: both retweeted submissions by followers and the account owner’s own additions. The result is pleasantly all over the place. It’s no Pan Galactic Gargle Blaster, but The Meaning of Liff Twitter feed keeps cracking me up. I like to think that wherever Adams is—the restaurant at the end of the universe, perhaps—he’s clicked the “follow” button.